I usually double this recipe. My family loves the size of these cookies. It feels like you’ve really got a treat in your hand. Sometimes I drizzle them with chocolate. 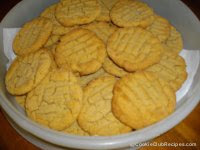 Cream together peanut butter, butter, brown sugar and granulated sugar. Add remaining ingredients and mix well. Scoop out a good sized piece of dough about the size of a big walnut. Roll in granulated sugar and place on ungreased cookie sheet. Depending on size of sheet you can get six to eight cookies on a sheet. Press with fork tines. Bake at 350 degrees for 8 1/2 to 9 minutes. Cool. Microwave for one minute or so, stirring half way. Drizzle onto cooled cookies with spoon or plastic sandwich bag with a hole snipped from one corner.